Unless you’re very, very new to the site, you probably know that I’m working on a graphic novel for my kids. 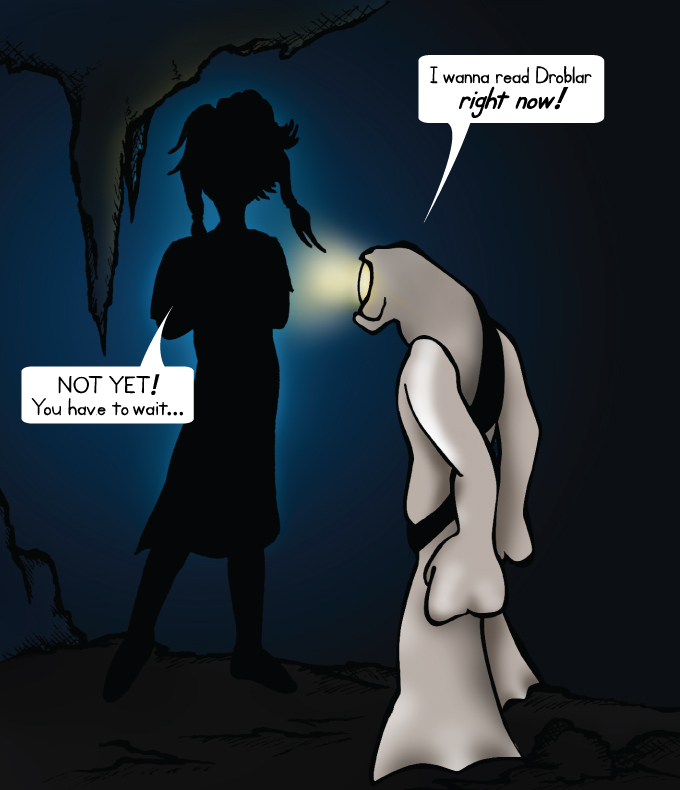 I’ve decided to publish it as a free webcomic online at Droblar.com. The plan is to launch Droblar on Tuesday, November 5th. From that point on, I’ll update weekly on Tuesdays. I’m still playing with the process of digitizing the artwork. Currently, I draw the comic in pencil on paper and then ink it by hand. From there, I scan the inked artwork into a cheap Photoshop knockoff for coloring and type setting. Needless to say, it’s not the best system and I’m certainly not taking advantage of the best tools. Later this month I will receive a shiny, new MS Surface Pro 2. I will name her Igor and she will assist me in bringing my abby-normal creations to life. She’ll have a swanky, touch-sensitive stylus, a fresh install of Autodesk’s Sketchbook Pro, and a steep learning curve. Master the derned thing as quickly as possible so I can settle on a coloring/typesetting process. If I can avoid shelling out the $50/mo for Adobe’s CS suite, then… uh. Good! So that’s where we’re at. Igor should show up toward the end of the month. Until then, I’m drawing deeper into the story. I’m trying to get better. I’m trying to get faster. And I’m trying to tell a better and better story. This entry was posted in Free Fiction, Sunday Sketches and tagged Cartooning, Comics, Drawing, Droblar, Family, Graphic Novel, Illustration, MS Surface Pro 2, Parenting, Sketchbook Pro, Sunday Sketch, Writing. Bookmark the permalink.